Conjunctions engages separately and connectively with therapeutic social work practice, psychoanalytically informed research methods and philosophy, as well as contemporary human service organisational cultures and predicaments, and the societal dynamics affecting social work and psychoanalysis. The chapters are gathered into several thematic sections: Practice, Organisations, Politics Policy and Culture, Research and a final chapter on death, dying and social work. The writing on each topic uses a blend of psychoanalysis, social theory and philosophy to illuminate and develop a psycho-social account of individual, organisational and social processes and dynamics. 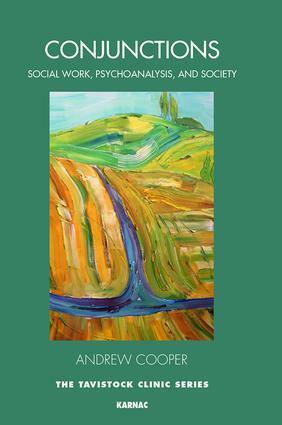 The author draws directly upon his own and others lived experience of clinical work, organisational stresses and strains, social processes, and research to generate conceptualised accounts of inner and outer experiential worlds in the hope of mobilising emotional and thinking responses in his readership. Conjunctions is therefore intended to be an intervention in modern professional, therapeutic and social life, as well as a contribution to understanding it. Andrew Cooper, a registered social worker and psychoanalytic psychotherapist, is Professor of Social Work at the Tavistock Centre and the University of East London. He continues to practise as a clinical social worker in the Adolescent Family Therapy service at the Tavistock, leads the Professional Doctorate in Social Work and Social Care programmes there, and works as a consultant to teams and organizations. In addition to his book Borderline Welfare: Fear and Fear of Feeling in Modern Welfare (co-authored with J. Lousada, 2005), he has written widely about therapeutic and relationship-based social work practice and research as well as the policy contexts that support or impede these practices. The Tavistock Clinic Series, written in a clear and accessible style, makes available the clinical and theoretical work that has been most influential at the Tavistock.